When Outlook becomes not responding it become a nightmare for us especially when there are many important emails we need to work on for the deadline. There are many contacts to email today. 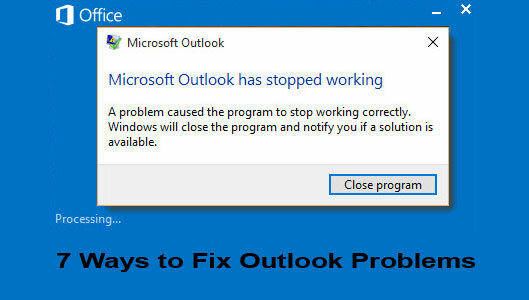 We have compiled 7 outlook problem that commonly happens and causing outlook cannot be opened. 1. Outlook not updating emails. In many cases because there is open window waiting for your username and password to be entered correctly. This happens when you just changed your password. Outlook 2016 need 5-10 minutes to realize that you password already changed. This is because email server is in WAN not in our LAN. To fix this problem, just keep press ALT key + TAB key repeatedly to find the window to enter your password. If you still cannot find the window this this way the easiest way is to close you outlook, wait about 3 minutes and open again your outlook. This time outlook will directly asking your username and password. Outlook not responding straight away when we open the outlook program, on our case we found that it stop responding when add-in “outlook meeting…” is active. Turn off this add-in will make outlook work normal. To stop this add-in start outlook in safe mode by typing outlook.exe /safe from run.. (windows 7 ). Outlook not responding in the middle of your work. In this case user have personal folder files (PSTs) that located on network drive. This was ok when user still using outlook 2007 or outlook 2010 but became problem with outlook 2013, outlook 2013 need power almost double from outlook 2010. To end this problem, move your PSTs file to your local drive and only attach huge PST ( 10 GB or more) when needed. Outlook will not start after you migrating from your old server. We found the culprit is outlook trying to open additional mailbox that still on old server address. To overcome this remove additional mailbox and only attach when its already migrated to the new server (same server). You can remove from control panel and click mail, or you can unplug the network cable, after get in to outlook, plug again the network cable, or disable wireless connection and enable again when outlook already opened. Outlook not responding for a moment when receiving emails. If you see status near task bar from outlook like “Outlook is trying to retrieve data from Microsoft exchange server outlook.office365.com and when back to normal you see status “Outlook online” then you are in online mode. You should change it to cached mode so outlook will check into cache file instead check online to the server all the time. After doing all above and you still having the problem try to repair your office installation because in many cases we have corrupted office installation files. Open control panel> Program and features. Highlight Microsoft office 365 ProPlus-en-us, Click Change button. You will see open window to choose quick repair or online repair. Quick repair will resolve the problem most of the time but if it still does not work, use online repair, this will took longer as it will repair all files. Delete corrupted outlook email account settings. From outlook click File> Account Settings> Account Settings… highlight the account and click remove. Close outlook when finish. Open outlook again, this time outlook will try to create a new profile because you already remove the account before, this will recreate your OST file (outlook cache file) and should resolve your problem. If you have large mailbox it will need the whole day to fully sync your email. So better to this during the weekend. I hope 1 of the 7 solutions above will resolve the problem outlook not responding. If yo think this article helpful please share using below button, thank you.